This two bedroom holiday home is located in Latour-Bas-Elne, a small town which is nestled between the sea and the mountains. 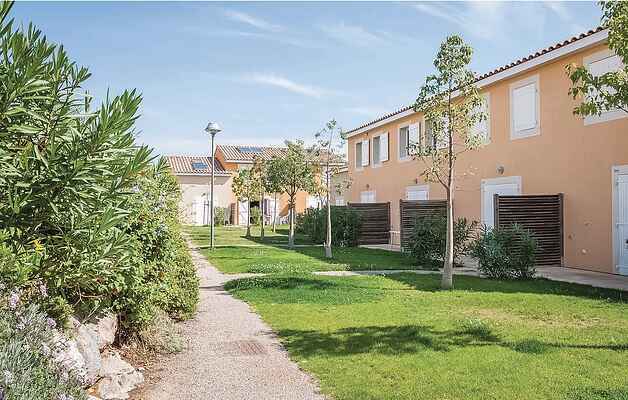 The seaside resort of Saint Cyprien is roughly 4km away, which is home to a marina, as well as a verdant landscape with green, wooded landscapes bordering 6km of fine, sand beach. Far from the hustle and bustle of the seaside resort, this tranquil holiday complex is a great choice for guests seeking a relaxing holiday. The complex comprises a series of duplex apartments and holiday villas, which each benefit from either a garden or terrace. This two bedroom apartment boasts a fresh and modern design, with a small kitchenette, living area, two bedrooms and a bathroom (with bathtub). The complex includes a communal outdoor swimming pool, with paddling pool (200m2), which is open from 10am-8pm from April to September (depending upon weather conditions). Please note that swim/board shorts are forbidden in the swimming pool. Also on hand is a wellness area (payable locally), fitness area and mini golf. Please note, it is recommended that guests have access to a car in order to explore the surrounding region. WI-FI in the holiday home is payable locally (EUR 20 per week) and one pet is allowed in the accommodation (1st and 2nd category prohibited) for an additional charge of EUR 46 per week. A baby kit can be rented locally (subject to availability).